Hi all. We're happy to say that Love at Certain Age has gotten into some outstanding film festivals for the autumn season. Not only is that great news for us, but it gives you even more opportunities to come see our film on the big screen. First, we'll be screening at the Salt Lake City Film Festival on September 29th at 2:50pm. View the schedule here. Next, we'll be playing at the Chagrin Documentary Film Festival in Chagrin, OH on October 2nd at 1:45. View the schedule here. Finally, we'll be showing at the Kansas International Film Festival in Overland Park, KS on October 5th at 12:20pm. View the schedule here. We're excited to announce our acceptance into the 15th annual Waterfront Film Festival! This will be the film's Midwest premiere. There will be two screenings: Friday, June 14th @ 11:30am and Saturday, June 15th @ 9:00am. If you're in the area we'd love to have you come check it out! Love at a Certain Age on "Get the FUNK out Show"
Thanks to Janeane Bernstein, host of "Get the FUNK out Show" for taking the time to interview us this morning on KUCI 88.9 FM. If you have a moment, check out their site...you can also re-listen to the interview HERE. The Newport Beach Film Festival a success! We had a wonderful turnout to both of our screenings at NBFF. Thanks to everyone that came out and for the great Q&A afterwards. Some of the emails we've been receiving from those in attendance have been extraordinarily moving and provides us with even more motivation to get the film and it's message out into the public! As filmmakers that's all we could ever ask for. Filmmakers Logan Hendricks and Kyle Clark at the Newport Beach Film Festival. FirstGlance Hollywood Film Festival Awards Announced! We're very excited to announce Love at a Certain Age won Best Editing for a Feature Documentary and the Audience Favorite Award at FirstGlance Hollywood Film Festival. Thanks to everyone that came out to show their support! You can find the entire list of 2013 Award Winners HERE. Thanks to Jory Carroll at SLUG Magazine for the great review! "What also makes this film standout is the wide range of emotions it is able to evoke. Although the overall feel is lighthearted and quite humorous, there are still several scenes that are very emotional and gripping. It may be an odd topic, but this film is really captivating and well done, and it just goes to show you relationships can be a struggle, no matter what your age." Well this is a good bit of news. We're excited to say that Love at a Certain Age will be screening at the Newport Beach Film Festival. It's a top notch festival that'll be playing some amazing films so we're very much proud to be a part of it. We'll have two screenings. One on April 29th at 3:30pm and the other on May 2nd at 6pm. Both will play at Island Cinema in Newport Beach. We'll be around for a Q&A afterwards so come out and stick around. Check out some more info on the festival here. "Local movie gets love at film festival"
After hearing about our recent success at the Fort Myers Film Festival, writer Bob Mudge decided to write an article about the film in the Venice Gondolier. We discussed our "Best Doc" award, the inspiration for the film and our plans for the future. Thanks to Bob and everyone at the Gondolier...you can see the article here. 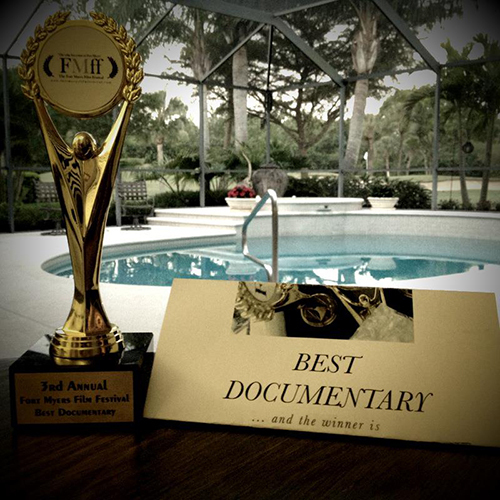 Hey, we won best documentary at FMFF. There were some great docs competing against us, including a few that made the Sundance trip, so we're extremely proud to be taking home the trophy. Oh and look who showed up for the Q&A...Thanks to Melissa DeHaven for the pictures! Logan and Fort Myers Film Festival director Eric Raddatz woke up early to talk about LAACA and FMFF on Florida's morning show Wink News Now. Watch the video here.